Part of a new direction for the 'Can I Tell You About...?' series focusing on values and character education. 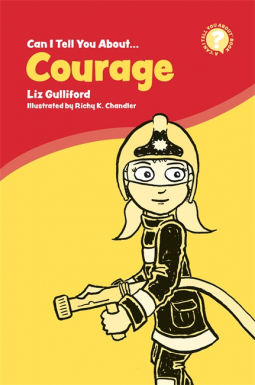 This book was a nice way to discuss courage with older children. I gives many different examples of courage and has many opportunities to pause and question your child. Due to the relatively small number of illustrations and slowish pacing I'd recommend it for older children. My 6 year old daughter said she liked it, but didn't seem that enthusiastic. There’s no colour in my book which didn’t make it appeal to me. There were also not many illustrations so it wouldn’t be much use with younger children as they like to see illustrations too. Positively - it gives some good examples of courage to share with others.